Released in 2009 the iPod shuffle 3rd Gen colors remained the same as the previous shuffle 3rd gen models in everything except colors. They are being offered also in green, pink and blue. The three control buttons in the earphone cable remained: volume up\volume down and action. With the last a user can either choose between playlists or activate the brand-new iPod feature – Voice Over. Apple titled the iPod shuffle 3rd Gen as the first player that talks to you. It can speak the names of songs, artists and playlist titles in 14 languages depending upon the language of a song on you playlist. The player also can voice the battery charge remained. Press and hold the action button for songs and artists and press and hold until the tone for playlists. This feature was to make up for the lack of the screen. The 2 Gb model was added to the line-up. Introduced on September 9, 2009. Storage capacity: 2 GB, 4 GB. Dimensions: 1.8 x 0.7 x 0.3. Colors: Silver, black, blue, green, pink. You can sync music while the battery is charging. You can disconnect and use iPod shuffle before it’s fully charged. In iTunes, the battery icon next to your iPod shuffle name shows the battery status. The icon displays a lightning bolt when the battery is charging and a plug when the battery is fully charged. Use the Apple USB Power Adapter, available separately. Connect iPod shuffle to a high-power USB 2.0 port on your computer using the included USB cable. The computer must be turned on and not in sleep mode. When the battery is charging, the status light on iPod shuffle is solid orange. When the battery is fully charged, the status light turns green. If iPod shuffle is being used as an external disk or is syncing with iTunes, the status light blinks orange to let you know that you must eject iPod shuffle before disconnecting it. In this case, your battery may be either still charging or fully charged. You can check the status by viewing the battery icon next to your iPod shuffle name in the list of devices in iTunes. If you don’t see the status light, iPod shuffle might not be connected to a high-power USB 2.0 port. Try another USB 2.0 port on your computer. If you want to charge the battery when you’re away from your computer, you can connect iPod shuffle to an Apple USB Power Adapter. Connect the AC plug adapter to the power adapter (they might already be connected). Plug the USB connector of the USB cable into the power adapter. Connect the other end of the USB cable to iPod shuffle. Plug the power adapter into a working power outlet. You can check the battery status of iPod shuffle when it’s connected to your computer or disconnected. The status light tells you approximately how much charge is in the battery. If iPod shuffle is on and not connected to a computer, check the battery status without interrupting playback by quickly turning iPod shuffle off and then on again. You can also use VoiceOver feature to hear battery status information. Solid green – Fully charged. Blinking orange – Do not disconnect (iTunes is syncing, or iPod shuffle is enabled for disk use); may be still charging or may be fully charged. Solid green – Good charge (VoiceOver “Battery full”, “Battery 75%”, “Battery 50%). Solid orange – Low charge (VoiceOver “Battery 25%”). Solid red – Very low charge (VoiceOver “Battery low”). With all the magic the VoiceOver function still sounds poor and requires a forgiving ear. You have to get by with the Apple earbuds only, because of the built-in controls and the USB cable is too short. Besides, the controls are placed too close to a person’s ear and that has proved to be a trouble for active users. On the brighter side, iPod shuffle can download not songs but playlists. iPod shuffle can inform you when the battery charge drops to 50% or 25%. 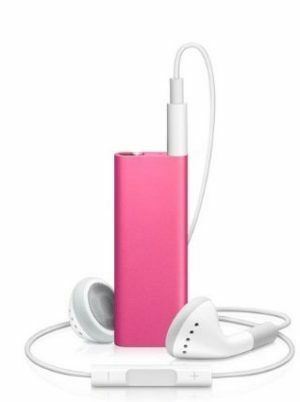 Trade in your used iPod shuffle for fast cash at iGotOffer.com. Instant and free quote, free and fully insured shipping, fast and secure payment: Used Mac Pro for sale. Check our prices! iPod Shuffle 3rd Gen 4 Gb: Released on on March 11, 2009 the iPod shuffle 3rd Gen was a step-back from the previous model.